Thayne-san, today’s destination is Muromachi Sunaba, a soba restaurant established in 1869 and located right between the lively Kanda area and Nihonbashi in Nihonbashi Muromachi, an area undergoing a major redevelopment project. Sunaba is a name that goes back to when Toyotomi Hideyoshi built Osaka Castle. A popular soba shop opened near the piles of sand used for construction, and so everyone called it Sunaba. This shop has roots dating back to that one. I didn’t realize the name Sunaba had such a history. That’s really interesting. Muramatsu: Hello, I’m Muramatsu from Muromachi Sunaba. Hello, Muramatsu. Your restaurant has a nice, relaxing atmosphere. And the small garden inside is beautiful. Muramatsu: We have the garden redone each season, cherry blossoms for spring, red leaves for autumn, and yukitsuri ropes for winter so that customers can enjoy each season in Japan. 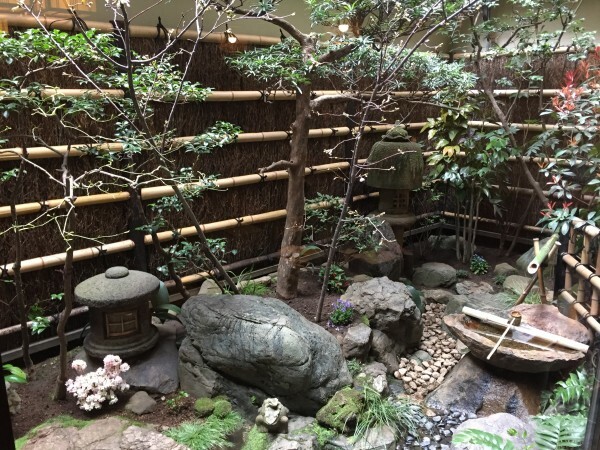 Soba is a part of Japanese culture, and the garden and the Japanese art on the walls help us enjoy Japanese culture even more. 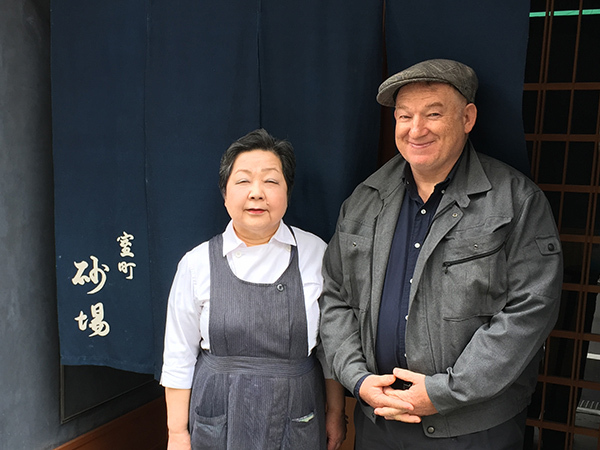 This restaurant was first founded nearby along Edo Street, and then we moved here in 1974. In a big renovation project in 2008, we changed the first floor layout so that we can look around the entrance or the tables and we can see the customers. We changed all the private rooms on the second floor and put heating pits under the tables. 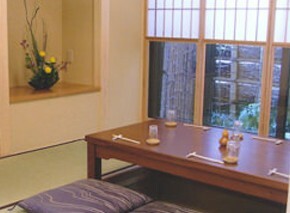 This made it a more comfortable place to spend timeーit’s more relaxing, and it has a more Japanese atmosphere. At a glance, it looks like an old fashioned restaurant, but there’s a lot of care taken with the building and the interior. Did you study anything like architecture or art at university? Muramatsu: No, nothing like that. I majored in business, but I probably spent more time doing kendo club activities than going to class. I wasn’t very good at kendo, so I was more into planning intercollegiate events and other things than practicing. Muramatsu: The intercollegiate event I was involved in was quite large, so there was a lot of work to do, and a lot of problems to deal with. I gave directions, organized things, stressed over things, and tried to decide things. When I think about it now, I learned a lot about life by watching the older students. Does your restaurant have any company rules or policies handed down from previous generations? Muramatsu: Nothing in particular, just don’t spread yourself too thin, and limit business to what you can see and focus on that. That’s what I often heard from my father and grandfather. Running a family business with a long history doesn’t mean doing exactly what your forefathers did, it’s important to change things, and it’s up to you to decide how to implement change. So I have to stay tuned to the current trends and constantly learn new things. Have you changed the menu, for example? Muramatsu: Yes, I think it has changed a lot over the years. For example, when you look at old menus, some of them have ice cream and anmitsu, but we don’t have those things now. In other words, they must have been a failure. They didn’t hand down the recipes that failed, so I don’t know much about them, but there were probably a lot of things like that. Then what’s special about your soba that has been handed down as is from previous generation? What do you recommend we try? Muramatsu: First, we have two kinds of soba here. We call the soba with a strong fragrance and color mori and the pale one made with polished buckwheat zaru. We still make the soba carefully using the old methods. We will always make it that way. 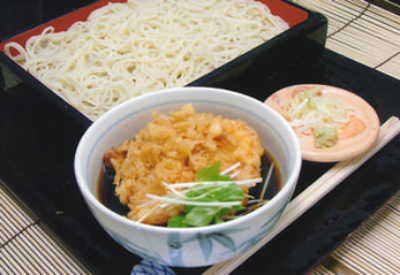 The item I recommend is the tenmori or tenzaru, which is made with pre-Edo style broth and battered shrimp and clams. It’s a common dish now, but our restaurant pioneered this way of serving soba. In that case, I’ll take a large serving of tenmori. I’ll have a warm okame soba. [Photo] Tenmori. Al dente soba is dipped in strong broth and eaten with crunchy and fragrant tempura fried in sesame oil. Delicious! [Photo] Okame soba. Kamaboko, shiitake mushrooms and shrimp are arranged to make a face on top of the soba. The broth is delicious. Muramatsu: Try some of our fried rolled egg flavored with soba broth. Thayne-san, this restaurant also has a reputation for some delicious foods other than soba. In addition to common items like fried rolled egg and grilled chicken skewers, there are also dishes made with seasonal vegetables to eat while drinking, and you can finish off your meal with soba noodles! Later in the evening, the restaurant gets really busy. This is also part of Japanese culture. There really is a lot to soba. Muramatsu: That’s right. Soba is a humble food, so I think we should try to go deep into that simplicity. Muramatsu: Yes. 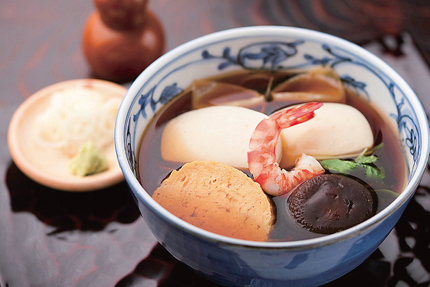 Famous gourmet foods from the Edo period onwards are all eye-catching foods such as sushi, tempura and unagi. On the other hand, soba is simple. But I think you could eat it every day and not get tired of it. I see! It’s definitely long and fine. Thanks so much for having us today. [Photo] A commemorative photo with the owner’s mother who runs the restaurant floor. In the dining seats on the second floor, enjoy special soba meals with seasonal delicacies.